This luxurious holiday home is located in the Bastide of Carcassonne. Our stylish and elegant apartment offers a comfortable place to unwind after an exciting day of exploring the enchanting Medieval castle in La Cite, the lively city centre, or the beautiful countryside of Southern France. Bedrooms: 2 bedrooms. The master bedroom is spacious with a queen size bed, large bright French window and plenty of storage. The second bedroom has 2 single beds with a bright window overlooking the quiet courtyard. Both have custom bedding and luxurious linens. Kitchen/Dining: Dining table seats 4. Fully equipped kitchen with 5 appliances including an electric cook top, full size oven, dishwasher, fridge with freezer, and microwave. For your convenience we also have all necessary cooking equipment, dish ware, and small appliances. Full size washer/dryer with ironing board and iron. Bathroom: 3 piece bath with large walk-in shower, sink with vanity, and toilet.There is a hair dryer available for your use. Living Room: The elegant and stylish living area includes comfortable seating to relax after a day of shopping or sightseeing. We have furnished our home with everything you will need to vacation comfortably. There is an IHome stereo connection if you wish to listen to your own music. Games, cards, and books as well as a flat screen TV with HDMI hookup so you can bring your laptop with your favourite movies or watch internet TV service programming or DVD shows from our DVD library. We have a wall safe to store your valuables. Parking: Public parking is available just outside our building. Public underground parking is also available in the multi-level parking garage directly opposite the apartment below Square Gambetta. Here you can find very economical and secure parking either by the week or the month depending on the duration of your stay. The Building: Our apartment building offers a secure entry system. Canadian now living in the UK. I create music for film, animation and video games. Love traveling and seeing the world. 3 piece bath with large walk-in shower, sink with vanity, and toilet. The elegant and stylish living area includes comfortable seating to relax after a day of shopping or sightseeing. A media system including a flat screen TV with HDMI connection, DVD and iHome. Fully kitchen with 5 appliances, full set of dishware and cooking equipment and small appliances. Flat screen smart TV with HDMI connection and internet TV service. Includes some additional English programming. Internet service with a selection of European channels including 14 additional English programs. 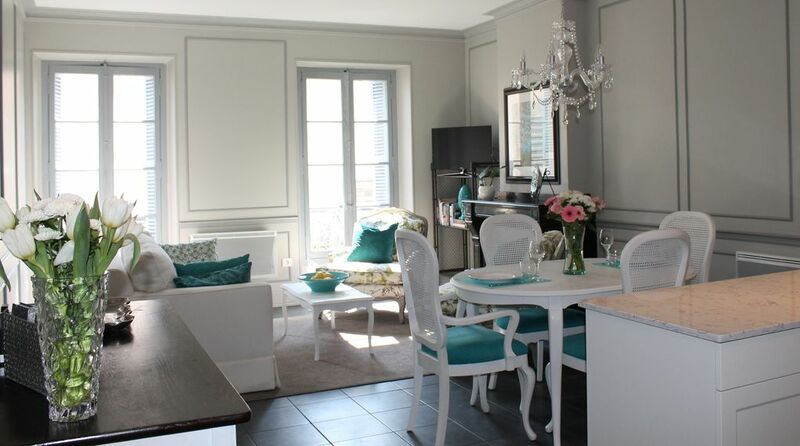 This beautiful apartment is located in La Bastide Saint-Louis of Carcassonne. It is a 10 minute walk from La Cité and a 5 minute walk to Place Carnot. We are close to all amenities, good restaurants, adjacent to Square Gambetta and across the street from Musée des Beaux-Arts. Our apartment is located within easy walking distance of the Canal du Midi, the train station and the shopping and entertainment areas of Carcassonne. We offer everything you will need for a wonderful holiday. We can not recommend this property highly enough , it is immaculate with everything you could need for your stay , beds very comfortable there is a bakery , fruit shop and winery with restaurant below . Location is prerfect for visit to old town and castles and also the station and canal boat trips , shops nearby . All in all a great place to stay if considering a visit to Carcassonne . Our flight was diverted and delayed due to a medical emergency on board and Philip was there to meet us although we were approx 1.5 hrs delayed . Plenty places to eat in old town and although commercialised very pleasant place to explore for a day , we were lucky to have sunshine ( September ) . We ate at the kiosk Gambetta one day for lunch and the chicken and steak baguettes were delicious and excellent value for money at 7€ . My family and I had a thoroughly enjoyable week in the apartment during early August 2018. The property itself was immaculately presented, very clean and in a great (central) location. Lots nearby in terms of shops and restaurants, and the secure public car park across the road was easy and worked really well (via a good value weekly pass). Carcassonne itself is beautiful and caters for various tastes. Other nice cities such as Toulouse and Castres very straight forward to reach from the apartment too. All in all, a great holiday, a lovely apartment, and a beautiful part of the world. Highly recommended. Thanks! Precioso, acogedor y cuidado al detalle. Un apartamento encantador y cuidado al detalle, confortable, acogedor, ideal para pasar una semana en familia, te sientes como en casa. A 20 metros tienes un parking (square gambetta) que por 20€ entras y sales durante 7 días. Puedes ir a cualquier parte de Carcassone andando, incluida la ciudad amurallada. No os perdáis las vistas desde el puente por la noche, vale la pena. We stayed her as a couple between Xmas and until after new year. We were welcomed at the flat and shown around, arrangements for this were made easily. The apartment is tastefully decorated and well equipped. We parked the sq Gambetta car park which is v close by. We bought a weekly ticket by popping into the car park office which was reasonable for our 5 day stay. Comfy bed and a good shower. Centrally located, but not too noisy, easy walk to both the shops and the historic city. Highly recommend the restaurant downstairs Verre d’un, we went twice! Would stay here again and recommend to anyone. Everything you need, neat and clean and chic too! Parking was close and easy. Very nice experience for us. Cars/Parking: You can comfortably spend a week in Carcassonne without a car. However, there are many activities just outside the city which are difficult to access without transportation. Our location is ideal for parking your car. There is metered street parking directly in front of the building. For long-term parking we would strongly suggest the underground parking adjacent to our building. The costs is 20 Euros per week. Carcassonne lies in the southern hills of Languedoc, France. There are many things to do in this wonderful town, experience an authentic Medieval castle overlooking the city, walk or cycle on the Canal du Midi, play tennis, golf, visit a winery, hike the cathar trails, step into history at one of the many churches and historical sites. Whether you are looking for a place to enjoy fantastic food and wine, or a lively experience for the whole family filled with music, dance and drama, Carcassonne is the place for your next adventure. We look forward to greeting you at the property. Show you around and give keys. Local list of shops and restaurants. Town map and information. Any delays in arrival time - Please contact in advance by phone. 50% deposit to secure booking. Balance to be paid 60 days prior to holiday arrival. Full refund up to 60 days of holiday. Housecleaning fee included in rental price. Guests will be asked to sign a rental agreement. We accept US and Canadian equivalent cheques, Paypal(+3%), and transfers to our European Account (IBAN). Our property manager will meet with you on your arrival and departure.